In large saucepan melt butter over low heat. Add marshmallows and stir until completely melted. Remove from heat. Stir in peanut butter until melted. Add KELLOGG'S RICE KRISPIES cereal. Stir until well coated. Cool slightly. Using buttered hands shape mixture into sixteen 3-inch footballs. Decorate with frosting. Best if served the same day. Note:For best results, use fresh marshmallows.1 jar (7 oz.) marshmallow creme can be substituted for marshmallows. Heat oven to 375°F (350°F for dark or nonstick pans). Place paper baking cup in each of 24 regular-size muffin cups. Make cake batter as directed on cake mix box. Divide batter evenly among muffin cups (about 2/3 full). Bake 20 to 25 minutes or until toothpick inserted in center comes out clean. Cool in pans 10 minutes; remove from pans to cooling racks. Cool completely, about 30 minutes. Spoon frosting into decorating bag with large star tip (size #5). 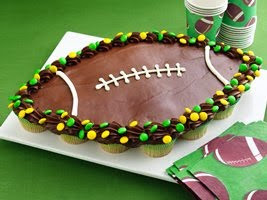 Arrange cupcakes in football shape using 15 of the 24 cupcakes. Pipe thick lines of frosting over football-cupcake shape. Using spatula, spread frosting over cupcakes. Pipe decorative border of chocolate frosting around edge of football. Sprinkle decorative border with candy-coated chocolate candies. Pipe laces with white icing. 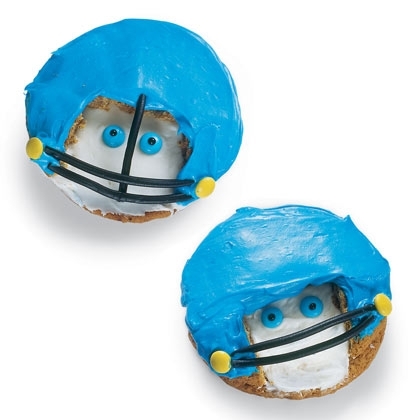 Frost and decorate remaining cupcakes as desired, and serve alongside football. 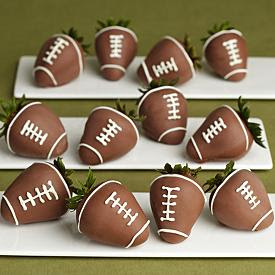 What food could be better for a football party than gourmet dipped strawberries decorated like footballs? 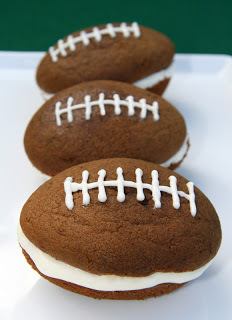 Each sweet strawberry is hand dipped and decorated with white stitches simulating the gridiron pigskin. 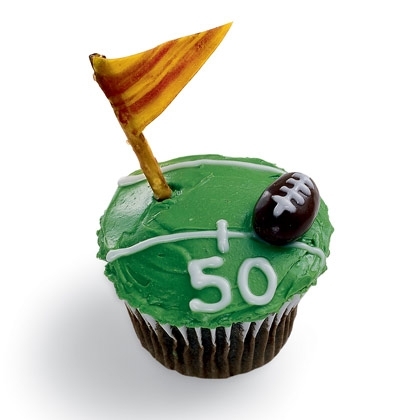 Send these to your favorite football enthusiast or order them to arrive for your football halftime party. Either way they will be remembered like a famous touchdown. Frost a cooled cupcake (baked from your favorite recipe) with green frosting, then mark the yard lines with white decorators' gel. For a pennant, wrap a fruit leather triangle around a pretzel stick and plant it in the field as shown. 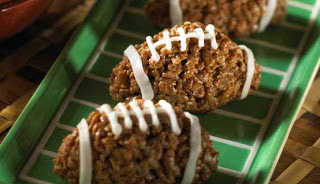 Set a chocolate-covered almond or brown almond M&M football topped with white decorators' gel laces on the field, and you're sure to score points with your favorite sports fans. Heat oven to 350°F. Line 13x9-inch pan with foil so foil extends about 2 inches over short sides of pan. Grease bottom only of foil with cooking spray or shortening.Make and bake brownie mix as directed on box for 13x9-inch pan, using water, oil and eggs. Cool completely, about 1 hour.Remove brownies from pan by lifting foil; peel foil from sides of brownies. 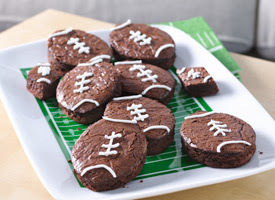 Cut brownies with 3 1/2x2-inch football-shaped cookie cutter. Pipe on decorating icing to look like football laces. Using a round watermelon, slice off a piece approximately 4 inches down on the stem end. Set cut piece aside to use later for mouth guard. 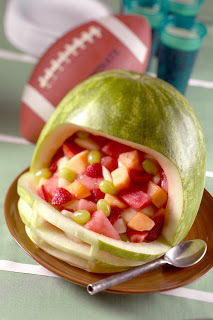 Make a curved cut from one side of the melon to the other to cut out the face portion of the helmet. Hollow out the entire melon. Take the piece that was set aside in step #1 and place cut side down. Place knife at the center of stem end and cut in half. Take one half of cut piece and draw mouth guard grid with a sharp pencil or thin marker as shown in picture. Remove flesh and using a small knife, cut out grid design. To assemble, place mouth piece on a plate. Place the helmet piece on top, pushing the mouthpiece ends towards the inside of the helmet. You may need to carve a little out of the helmet ends to fit the mouth grid comfortably. Fill with fruit salad. Bake the cake in a 9 x 13" pan according to the directions on the box.Let the cake cool completely.Crumble the cake into a large bowl.The smaller the crumbles the better.Mix in about half the jar of room temp frosting. It really depends on how moist your cake already is. Add more if you need it. Use the back of a wooden spoon to combine, NOT a hand mixer. You want the mixture to be about the same consistency as cookie dough, moldable but not mushy, able to hold its own shape but not too dry.Line a baking sheet with wax paper. Scoop some "dough" and roll it into a ball about 1" in diameter. Squash and mold your ball into a football shape.Fill up the sheet and chill in the fridge.While the footballs chill, heat up half a bag of the chocolate candy melts. Microwave in 30-second intervals, stirring between.Be careful not to over-microwave it because it will get dried out.DON'T add water if this happens. Use the shortening. around the base. Wait until it hardens. This will help keep the football "glued" to the stick while you dip the whole thing.Dip the footballs in the candy to coat them, tap the stick on the edge of your container gently to remove the excess coating. Then poke the stick into the styrofoam block, making sure the pops don't touch each other while they dry.In the meantime, you can heat up your candy pens. Follow the instructions specific to your pens...usually you set them in some very hot but not boiling water.Draw on the laces with the white pen.Use slow movements and even pressure. Lay the pops down on a wax-covered baking sheet to make decorating easier.Let the laces dry. To make each one, first spread a thin layer of frosting on a large, soft cookie. Cut a square from a second cookie to create a helmet shape and set it atop the first. Coat the helmet with frosting tinted the color of your family's favorite team, then add eyes (M&M's Minis with black decorators' gel dots), a black string licorice face mask, and 2 more M&M's Minis for the helmet's ear holes. In a large bowl, cream butter and sugar until light and fluffy. Beat in eggs and vanilla. Combine the flour, cocoa, baking soda and salt; add to creamed mixture alternately with water and buttermilk, beating well after each addition. Drop by tablespoonfuls 2 in. apart onto greased baking sheets. Bake at 375° for 5-7 minutes or until set. Remove to wire racks to cool completely. In a small bowl, beat filling ingredients until fluffy. Spread on the bottoms of half of the cookies; top with remaining cookies. Yield: 1-1/2 dozen. The key here is finding a mini egg shaped pan. Make the batter according to the recipe then scoop them into your well-greased pan – nearly full, with tops as smooth as you can get ‘em. 18 minutes at 350, you might want to start checking them around 16 – 18 minutes – they’re done when a toothpick inserted into the middle of a cake comes out clean.To fill and decorate them, cut each cake in half and gently brush off any large crumbs. Put a big dollop of crème on the bottom half (enough to scare you a little bit) then put the top on and gently push down. Don’t worry if it’s not perfect – you can clean around the edge with a butter knife and make it pretty.Use a pasty bag with a small round tip to pipe on the laces.You can use a toothpick to fix the lines.